It occurred to me this past week that Springwater Trails could expand the development of our original plan for a 32 mile continuous trail around Springwater. While being a trail angel for a long distance hiker named Chosen, I had the opportunity to help navigate her trek through the area of Swain on the Finger Lakes Trail and Franklinville on the North Country Trail. Due to hunting season, obstacles and closures on the trail, I followed her by car around the back roads of Allegany and Cattaraugus County, enabling her to complete a day distance trip of 22 miles on state forest trails and dirt or paved roads without carrying her full backpack. It’s called “slackpacking,” a benefit that hikers have when they have a trail angel to provide support services. On the local level, this experience with a long distance hiker expanded my hike planning to taking a look at our original plan of a continuous 32 mile trail around Springwater. The idea of the trail around Springwater was developed a few years ago by an original committee called Springwater Parks and Trails. Using this background information, our president Mark designed a large scale map of where the trail could possibly be located. To date we have 4 trail areas in progress, 3 with landowners permission and one on state land. The proposed “master plan” in the northeast section of Springwater accesses Harriet Hollister State Park to the north in Canadice to the newly acquired state park property on Wetmore Road, following Town Line Road westward near the Nature Conservancy areas to a dirt road called Reynolds Gull Road. The trail would then drop unto Canadice Lake Road, hopefully accessing some private property someday and connect with the DEC Hemlock/Canadice State Forest at Johnson Hill. Once reaching the large parking lot Rt. 15A, hikers could continue hiking the south boat launch trail to Hemlock Lake, or access the Village of Springwater to the south to explore the western part of the town. 13 hikers this past Sunday traveled the proposed route, starting at 2000′ and dropping to 1000′. Two cars transported 10 hikers and two dogs to the top of Reynolds Gull Road while 3 hikers leisurely enjoyed hiking the Johnson Hill Trail, crossing the top of a dry waterfall. Long distance hikers completed 6 miles in 2 hours exactly. They picked up speed as they walked paved and dirt roads, accessing a DEC grassy trail off Johnson Hill Road which provided scenic views of fall trees, Hemlock Lake, steep gullies and waterfalls. Reynolds Gull Road alone is a beautiful road to walk and the waterfall on the Johnson Hill trail is spectacular most of the year, especially in the winter and spring. After the hike we warmed ourselves by the campfire at Pati and Jim’s, where a delicious roasted ham was prepared by Jim, healthy meals by others, and even 3 desserts! Thanks go to Pati and Jim for hosting our social and to Chosen for her inspiration and education. Have you ever seen an Allegheny Ant Mound? Join us for this Sunday’s hike and you will observe several. 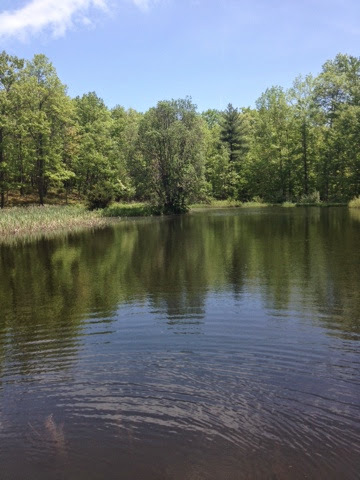 Experience one of the Finger Lake Land Trust’s finest nature preserves, 794 acres of recovering forest. In the 1970’s this tract was severely damaged by extensive logging, so much so that the town closed it to the timber companies, a legislative first. As we explore the deep ravines and enjoy the wide variety of hardwoods and hemlocks, we will be providing a service for the Land Trust. The donor of this land has stipulated that each year, during hunting season, it must be patrolled to inform any hunters that they must stay outside the boundaries of the preserve. Not to worry. In the numerous times I have patrolled here, I have yet to encounter a hunter. 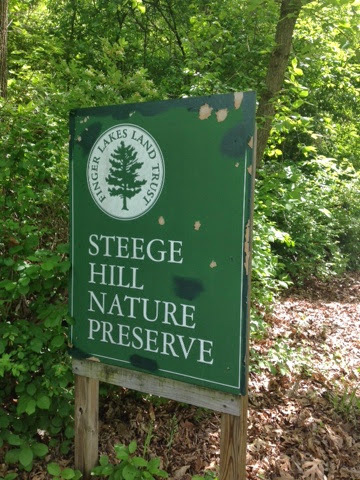 Steege Hill contains 7 miles of trails with varying terrain. Most are abandoned logging roads. All groups will begin their journey at the small parking area on the east side of Steege Hill Road ascending approximately 1/2 miles to the top of the preserve. A map of the trails is included with this description and also can be accessed at the FLLT website. Naturalist Hikers will bear right onto the yellow trail and make a counter clockwise loop, returning to their starting point. It is a fairly level loop of approximately 2 miles with a few minor uphill sections. This group can spend time at a small pond and admire the several species of trees. The forest is quite open. Tourist Hikers will bear left on the yellow trail then drop down to the left on the blue loop. The terrain is rocky in places with some ups and downs. Depending on time, this group may continue on the Blue loop and rejoin the Yellow trail, completing the loop in a clockwise direction. If a longer walk is wanted, they may bear left on the Red trail and follow it to connect with the Yellow loop. This hike will be about 3.5 miles. Climbers will circumnavigate the trail system. Starting out on the White trail, climbers will drop down the hillside and back up for a 2 mile loop. The trail could be quite muddy so boots and/or gaiters are recommended. Climbers will then traverse the Blue and Red trails back to the Yellow loop. Plenty of climbing involved with some steep spots. Getting There Parking is VERY LIMITED. Roadside parking is not advisable. Please carpool from the Springwater Town Hall, leaving at 12:30. Drive time is about 1 hour 15 minutes. Directions: Take 390 South to I 86 East. Take Exit # 48. Turn Right on NY 352. Go 1.5 miles. Turn right on S. Corning Rd. (Chemung CR 10). Go .7 miles. Just after bridge turn left on Steege Hill Rd. Go 1 mile. Slow down. Parking is on left. Preserve sign is difficult to spot. How far can our hikers really hike….6 miles, 8 miles, 12 miles in 2-3 hours? What if they challenged themselves to hike for 10 hours for a long distance hike of 20 miles? This past week I had the honor to be a trail angel for a long distance hiker, inspiring me to design this week’s hike as a distance hike. More details to come on meeting a woman that is hiking the North Country Trail from North Dakota to New York for a distance of 4,600 miles. She is in our area this week on the Finger Lakes Trail. We will meet in the large parking lot at the entrance to the South Boat Launch on Hemlock Lake at 1:45 for a quick take off at 2:00. Remember it is bow hunting season, wear bright clothing and respect the hunters that use these trails this time of year. Climbers/Tourists will be taken to a designated location at the top of Johnson Hill/Reynolds Gull Road. Although they will be limited to a 2 1/2 hour hike, they will attempt to cover 6 miles, including a steep downward road trek, picking up the Johnson Hill trail, and finishing over the bank next to Reynolds Gull onto 15A. Naturalists will car pool to the Johnson Hill trail, crossing over the top of a double cascade waterfall, then proceeding for a slight uphill hike into a Hemlock forest high above the Reynolds Gull waterfalls for a distance of 1.5 miles round trip. Scenic views of Hemlock Lake, Springwater Creek, waterfalls and a beautiful mid fall deciduous forest will offer many picture taking opportunities. After hike social will be at Pati’s and Jim’s camp on Wheaton Hill Road. Watch for the Springwater Trail sign 1/2 way up the hill between Canadice Lake and Wetmore Roads. As always, bring a healthy fall dish to pass and your preferred drink or make a donation ($5) to the social fund. Jim will prepare a tasty roasted ham for our main meal! Directions: (42.668316,-77.592123) The parking lot is on the west side of Rt 15A just south of Hemlock Lake. Details are available here. Linda made this recipe for the Springwater Trails social at the Laffords.